The first time I was in Quebec City was around 1995 when I went there with my mom. While we were poking in and out of the shops on Petit-Champlain, I could hear a musician playing on his keyboard. I paused and listened and really enjoyed his music. My mother and I both bought a CD from him. I really enjoyed the CDs, and so contacted him at the phone number that was listed in the CD to order more CDs. I bought a complete collection for both myself and my mom. As years went by, the phone number I had for him no longer worked, and neither did the address. So I thought I would just have to be content with the CDs I had. I went to Quebec City again last week. I wanted to go to Quebec City to propose to my girlfriend, since I remember it being the most beautiful city I had ever seen. 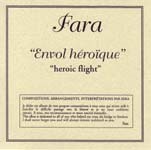 While there, I made a point of looking up Fara. I inquired at the Theatre Petit-Champlain, as that is where I saw him perform 12 years ago. I fully expected them to give me a confused look and tell me they had never heard of him. Instead, they pointed outside, and said, "There he is. Fara!" He looked much different since he used to have long hair. He was just packing his stuff away and didn't have any CDs with him. So, I told him where I was staying and he said he would bring some CDs by. Soon after, I realized we did a poor job of planning since I had no idea when he would be coming by the hotel. While we were in the lobby the next morning waiting for our bus tour, my fiance sees him. "There he is", she says. "Huh? Where?" I respond. Anyways, there he was, holding some CDs for me. We met up and had a nice conversation. I told him how much I liked his CDs and how people often email me trying to find more Fara CDs (I had a lame web page about him on my web site). So, he said we should work together to make him music more accessible. So, I created a web site for him, and I'm going to try to get his CDs available for sale online and through the iTunes Music Store.